In April 1485, Bartolomeo Minio, who had managed not to die of malaria in Nauplion, or of camp fever in the Ferrara War, was elected captain of the trading muda to Flanders and England. 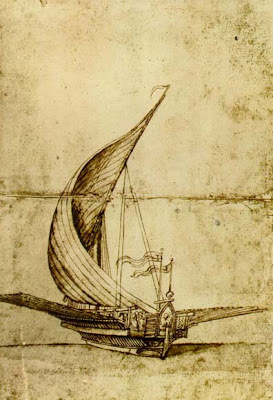 This was the biennial sailing of four great trading galleys carrying 200,000 ducats worth of goods belonging to Venetian merchants and the state for trade in English and Flemish markets. The galleys were transporting metalwork from the east, currants, molasses, spice, sugar, raw and spun cotton, lambskins and hides, wax, paper, silk, various kinds of eastern and Venetian fabrics, carpets, small luxury goods, and much else. I don't have a horse in that race. But I would like to call attention to the style of stonecutting in the pyramid, and the style of stonecutting at Ai. Yannis. And then I would like to call attention to the style of stonecutting at Nauplion. There are walls on Acro-Nauplion in this style, but there is also a good 20 meters of wall of the same style in the old city, starting behind the Hotel Leto and continuing along the vacant lot next door. Aerial photographs make it fairly certain that this is the survival of a wall that enclosed a large area of a lower city that probably included much of the area that was gutted of important survivals by a Greek government agency to make a parking lot for the unspeakable overpriced government hotel above. 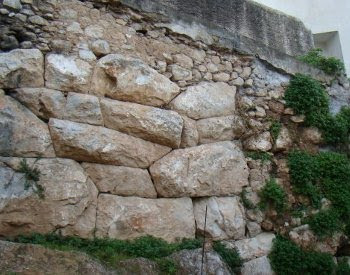 The walls at Nauplion are considered Hellenistic, which means, loosely, in the vicinity of 250 BC. This was an insecure time: walls and watchtowers were needed. Hellenikon, as an outpost for Argos, could monitor the traffic on the three major passes into the Peloponnesos. 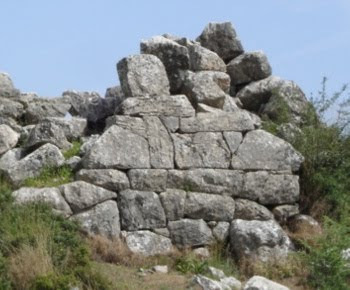 Ai Yanni could communicate between Nauplion and the citadel of Asine. Ai Yanni was a considerable construction in its day, a squarish structure with a surrounding ring wall, and another ring wall not far down the hill. In 1978 these rings were distinct. The construction of a house and roads, and use of more of the hill for agriculture has resulting in the destruction and moving of many of these great stones with nicely-cut joins. At Ai Yanni massive stones from the original construction are used -- possibly in their original position -- to support the porch roof, and inside the chapel large stones are visible where the chapel was extended past the stones. 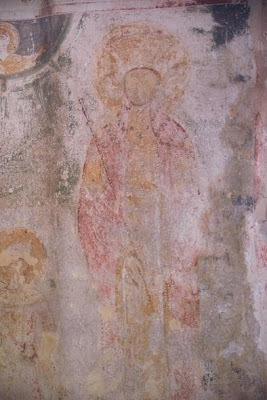 This is clearly seen on that exterior photograph above. 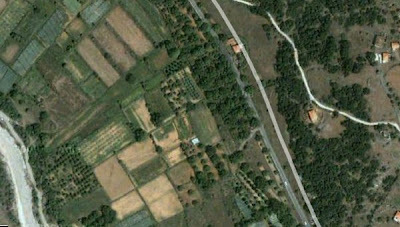 In the aerial photograph, Lefkakia is unseen to the right, and a long range of very high and hostile hills begins at the left. There is, or was, a very ancient well below the hill on the left. This was a deliberately chosen, easily manageable site. 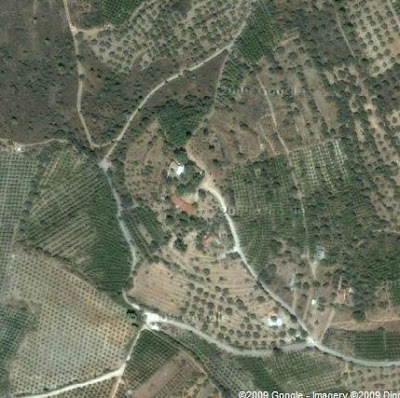 Aerial photographs of Hellenikon -- the Google World images were not clear enough to put here without too much explanation -- show that it, too, was a small rounded hill set out in front of very high and hostile hills. Too much damage has been done to the immediate area for that to be visible on the site -- a parking lot has been bulldozed out, roads cut through, lowland filled in. But from the base of Hellenikon on the south, the hill would have been seen to rise up to the pyramid which continued the angle of slope. I look with the eye of an amateur, that is, with the eye of a lover. I would like someone who is smarter than the thermoluminescence people to take these sites as a unit and give me better dates. I can think of several explanations, but this is not my field. I have twice tried to take American archaeologists to look at Ai Yanni, in 1978 and 2008, only to be told that they were too busy. This is an addition, nearly two years later. When I wrote the foregoing, I had not particularly thought about the pictures of Ag. Adrianos-Katsingri, but on further consideration prompted by Cyriaco of Ancona's visit there, I want to include that little fortress which looks out over the broad Midea valley with these other three.